My name is Sonia Acevedo, and I am one of many beginning farmers trying to return to the land, committed to growing food for my family and my local community. I have been a farm worker and small farmer in Maine since 2005. I was inspired to a life of farming for a lot of reasons–because I was worried about the security of a food system dependent on fossil fuels, genetic engineering and chemicals, because I was concerned for the human rights of farm workers here and abroad, because I believe in community self-determination, and because with farming I get to experience a profound physical and spiritual connection with land and nature. Unfortunately, like many other aspiring farmers and farm workers, I’ve been are barred from making my farm dreams a reality due to high land prices, rural gentrification and a cultural lack of support for the importance of farm work. Barriers of race, class, ethnicity, and gender not only prevent people from getting land security, but also influence our ideas of what a “farmer” is. I had a lot of feelings and questions that came up the longer I spent searching for a place to farm: Is a farmer the person who does the farm work or the person who owns the land? What makes a farmer–having a farm business or the act of farm labor? Why are so many images of “new farmers” young, white, heterosexual, and middle class? If there are so many older farmers wanting to keep their land in agricultural hands, and there are so many beginning farmers seeking land, then what is preventing them from meeting each other’s needs? These questions, and the many conversations I’ve had with other farm workers and friends the past few years, inspred me to start listening and stop talking. I have been working on a listening project, recording interviews with folks all around the state of Maine from a variety of different backgrounds who have been struggling with accessing the land they need to live and farm. 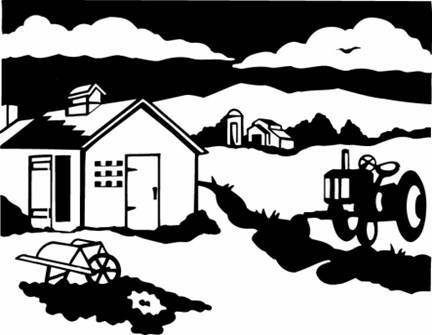 If you identify as a farmer or a farm worker, I’d like to hear your stories about what has been hard about finding land to use for your projects or livelihood, your account of what it’s like to work other people’s farms as a farm worker, tenant farmer, or apprentice, and your struggles to hold onto the farmland you already own or use. If you’re in a land arrangement that is working for you, I want to hear how you came to it and what you think is making it work. I am collecting interviews and written submissions for a pilot publication to be released this summer. The hope is that the publication will be made available in zine and book form, as well as being made available online as a PDF, to raise awareness around the issue of land access for beginning farmers and to broaden commonly held definitions of what it means to be a farmer today. The publication will be used to fundraise for non-profits working on issues of farming and land access, and will be registered under Creative Commons’ Attribution-NonCommercial-NoDerivs 3.0 Unported (CC BY-NC-ND 3.0) license. (click here to learn what that means) Deadlines for submissions and interviews is May 1st, 2013, but if it takes you longer to get back to me, don’t hesitate to be in touch–this project will be ongoing, and will pick up where it left off in the fall, at the close of my farming season in November. Any interviews or written pieces can be kept anonymous. This project is open to conventional and organic market farmers, migrant workers, farm hands, subsistence farmers and apprentices–anyone for whom your relationship to land constitutes the center of your life or livelihood. If you’re interested in participating in or supporting this project or have any questions feel free to call 207-716-6441, or send an email to farmhand207@gmail.com.